The introduction of the rapid diagnostic test Xpert MTB/RIF in Nigeria has led to a rise in the number of people diagnosed with and requiring treatment for MDR-TB. Consequently, patients who needed immediate treatment were kept waiting or even refused admission by treatment centres. Nigeria has only ten MDR-TB treatment facilities, with a limited patient intake capacity. 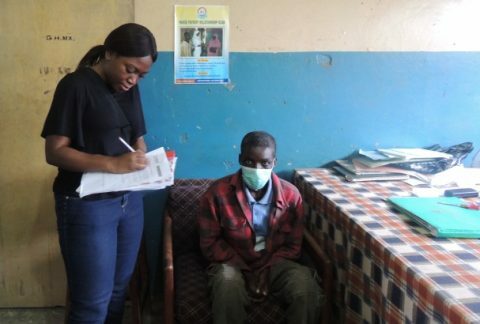 To ensure better access to appropriate care for people with MDR-TB, Nigeria revised the national Programmatic Drug-resistant TB (PMDT) guidelines so that alternative models of care could be introduced. A pilot study was launched to introduce ambulatory care in eight selected states. Three different treatment models were studied: hospital admission during the initial 3 months of treatment; hospital admission during the initial 8 months; and treatment completely in the community. Community-based care involved training general healthcare workers to deliver ambulatory care services, including home visits to patients; delivery of daily medications; nutrition counselling and assistance; and ensuring that patients take effective infection control measures. The pilot study showed that treatment of people with MDR-TB in the community is both effective and feasible. The ambulatory MDR-TB treatment at community level is being scaled up so that, increasingly, patients do not necessarily need to wait for admission to facilities. Important factors for success include capacity building of supporting staff; logistical support for patients’ daily transport for directly observed treatment (DOT); quality supervision and patient monitoring; and timely transport of laboratory samples and results.